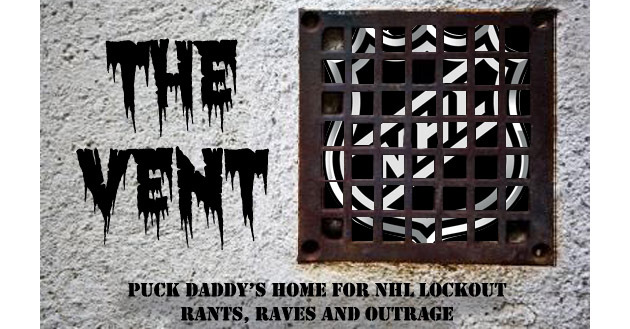 THE VENT is a forum for rants, raves, pleas and laments from hockey fans across the world about the NHL lockout. It runs every Tuesday, Thursday and Sunday. If you've got a take on the lockout and need to let it out, email us at puckdaddyblog@yahoo.com, Subject: The Vent. Dave Morton doesn't want to see another empty space on the Stanley Cup again. He wants control of the world's greatest trophy taken away from the Trust and put in the hands of the Canadian government. Boycotting the games won't work, since many fans will continue to go anyway, and in the case of most of the original 6, they're all big business season ticket holders anyway. Bettman and company have proven they couldn't care less about the fans, they just want more of our money. Locking out the NHLPA is a legitimate method of dealing with an unreasonable union when all else fails. But, it should not be used just because Bettman says you accept our first ridiculous offer, or we take our ball and go home. Bettman has 2 interests; one is money and the other driving force is to CONTROL. Unfortunately, Donald Fehr and the NHLPA aren't cooperating so far. If all, or most Canadians wrote to their Municipal, Provincial, and Federal representatives, it just might happen. I can't think of better way to deliver the message to Bettman and company, than to take back the Stanley Cup! Can we Americans get involved, Dave? Megan Stecklein is tired how hearing about how much the players care for the fans because the fans do not matter in this lockout. We're almost at the 90 day mark (or maybe we've past it - I've lost count) of this ridiculous lockout and I am sick and tired of being reminded on a daily basis that if I want to watch hockey, I have to try and remember if the DU Pioneers are still playing. I have to ask myself if any network broadcasts Cutthroats games, or is it just the Eagles, and only some games, not all games. Because who would put CHL hockey on TV in a market like Denver, rabid with casual sports fans? I'm sick and tired of being given false hope by both sides that a deal is just around the corner, only to turn around the next evening and find out that talks have broken off (again). Yes, we do deserve better. We deserve to go to an arena night after night to watch the best players in the world, in the highest professional league in the U.S.
We deserve to be thinking about which jerseys we want for Christmas, and if the playoffs started today, who would play whom. But most of all we deserve not to be patronized. I'm all for standing your ground, but the players need to stop pretending that they care about the fans. Stop pretending that they are looking out for anyone's interests but their own. If they did care, they'd be playing hockey right now, they'd be providing us, the fans, with the escape from our own lives (whatever that entails) that we get from watching then play a stupid game. I'm sick and tired of the bull----. But mostly I'm sick and tired of being told that I matter in word, but actions of both the league and the NHLPA saying otherwise. I have never mattered in these negotiations, not one bit. No fan has. Finally, Jeff Carver has an interesting boycott idea. While i agree with the idea of having a complete fan boycott of each teams first home game, I think I have a minor addition to the plan that will really help vent fan frustration. We know that boycotting one game is just symbolic and really won't hurt the owners or players financially in any significant way. The point of the boycott is to embarrass them just a little. Why not embarrass them just a little more? I suggest that instead of a complete boycott, we find about ten of the most obnoxious humans we can find and have them go to that first home game as the fans surrogate representatives. We place a few behind each bench and outside the owners box. The players would not only have to play in front of a nearly empty building, but they would also have to listen to a two and a half hour tirade pour down on them about what a bunch of greedy douchebags they are. Maybe we could choose our surrogate representatives with a contest at a local bar. Whoever can sustain the longest, funniest most irritating diatribe wins the free tickets and has a chance to be the fans surrogate for the game. Of course we have to have a least a couple extra fans to go with them to video the proceedings so all the rest of us hockey fans can enjoy the spectacle on YouTube after the games. How do we begin to support this idea?